Happy Tuesday, everyone. We haven't had quite enough Batman in our lives yet this year, so we're bringing you Batman...again. 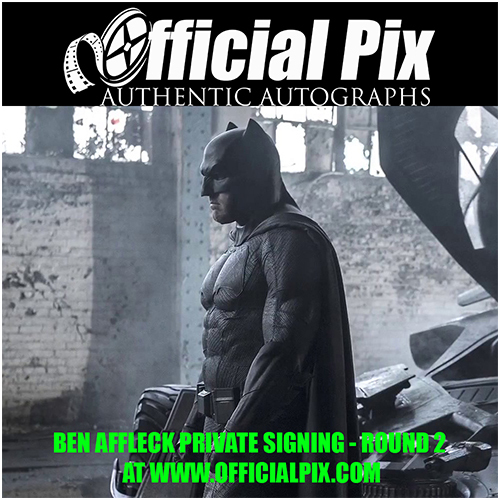 We're very proud to announce a second signing with Ben Affleck in July! This should give everyone plenty of time to get their items in from around the world. We are also offering more than 100 different ordering options including photos, posters and CGC Signature Series options for comics & magazines. As usual, we are limited on the amount of pieces we can take for this signing, so there is a chance that we could sell out before the order deadline. Orders will be taken through: TBD (or until Sold Out) and all Send-In items must arrive by Monday, July 9th to be included. Available now right here!